WASHINGTON (AP) - A grand Washington ritual became a potential casualty of the partial government shutdown as House Speaker Nancy Pelosi asked President Donald Trump to postpone his Jan. 29 State of the Union speech. 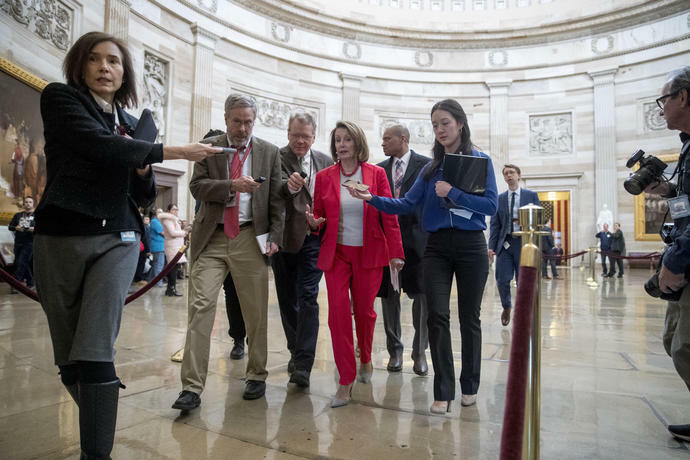 She cited concerns about whether the hobbled government can provide adequate security, but Republicans cast her move as a ploy to deny Trump the stage. Trump stayed quiet on the request throughout the day. During an Oval Office visit, Sen. Rand Paul said they discussed the shutdown but the president did not offer any reaction to Pelosi's suggestion to put off the speech. "If Mrs. Pelosi refuses to allow the president to deliver the State of the Union in the House, I propose we move it to the Senate and make it happen!" Paul said. Sen. Lindsey Graham, a South Carolina Republican who has been working on bipartisan strategies, declared glumly: "I am running out of ideas."